Close to 129 million tourists visited ASEAN member states last year according to figures released during last week’s ASEAN Tourism Forum (ATF) in Vietnam. Except for Malaysia, all ASEAN member nations saw an increase in arrivals. With the encouraging increase in tourist arrivals, officials in the region reaffirmed their commitment to pepper profits with promoting sustainable tourism – which is one of the key tenets of the ASEAN Tourism Marketing Strategy (ATMS) 2017-2020. At the 22nd ASEAN Tourism Ministers Meeting held during the ATF, ASEAN tourism ministers agreed to roll out measures to battle issues such as over-tourism after famous tourist destinations such as Phuket (Thailand), Bali (Indonesia) and Boracay (Philippines) were affected by over-crowding and pollution resulting in damage to their once pristine environments. “We are learning that overcapacity is becoming one of the major issues, and we are all going to pay a lot of attention to it,” said Weerasak Kowsurat, Thailand’s minister for tourism and sports. During the forum, Seul Ki Lee, an Associate Professor at South Korea’s Sejong University’s Department of Hotel and Tourism Management, spoke to the media about how technology can be used to promote sustainable tourism. Noting that technology plays a key role in improving the interactivity and experience of tourists, Seul also hailed the impact it has on encouraging sustainability by reducing the need for printed material as well as leveraging digital content to promote a destination. “I think tourist destinations have life cycles which depends heavily on content,” he said. “With digital technology, you can extend the destination’s life cycle and improve sustainability,” added Seul, who is also Director of South Korea’s Tourism Industry Data Analytics Lab. The ATF also touched on efforts to diversify ASEAN tourism products, with the ASEAN Tourism Ministers Meeting’s Joint Media Statement elaborating on the development of the ASEAN Tourism Packages 2019-2020 – which features more than 130 tourism products covering multi-ASEAN destinations from 38 travel agents with 69 travel packages. Acknowledging the potential that various festivals in the region have in attracting tourists, the ministers supported an initiative to develop festival tourism in addition to the existing tourism products. In line with the ATMS 2017-2020, the ministers also agreed to focus on the development and implementation of wellness tourism and culture and heritage tourism as the regional thematic experiences for 2019. The last ASEAN Tourism Ministers Meeting in January 2018 saw the group identify gastronomic tourism as an effective means of poverty reduction, resource efficiency, climate change mitigation and cultural protection. During last week’s meeting, the ministers noted the progress of the development of the Gastronomy Tourism Master Plan, as one of the deliverables for Thailand’s ASEAN Chairmanship this year, with the creation of a sustainable gastronomy tourism guideline which could systematically address the sustainable food system and enhance the livelihoods of local communities. 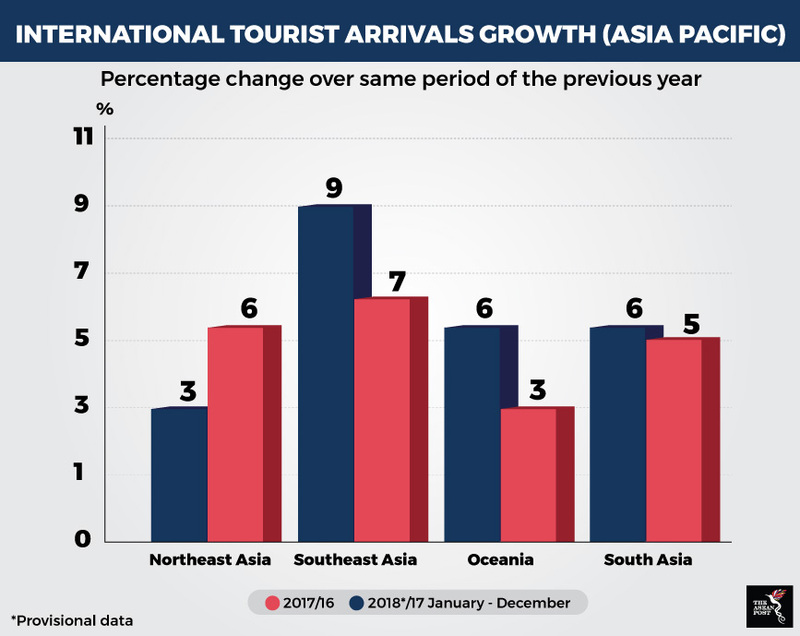 Data released by the World Tourism Organization (UNWTO) on Monday puts ASEAN’s annual tourist arrival growth at seven percent, the highest in the Asia Pacific region. ASEAN is followed by Northeast Asia with six percent growth, South Asia with five percent, and Oceania with three percent growth, which are all well below the Asia Pacific average of six percent. The data from the UNWTO World Tourism Barometer, which is published six times a year and monitors short-term tourism trends, cites a favourable economic environment and strong outbound demand from major source markets as among the drivers of growth. The growing size of middle-income families, enhanced connectivity, increased visa facilitation, the stability of fuel prices and the proliferation of budget airlines are some of the other factors contributing to the growth. While agreeing that tourism has grown to become one of the most powerful drivers of economic growth and development in recent years, UNWTO Secretary-General Zurab Pololikashvili also highlighted the need to develop the sector appropriately. “It is our responsibility to manage it in a sustainable manner and translate this expansion into real benefits for all countries, and particularly, to all local communities – creating opportunities for jobs and entrepreneurship and leaving no one behind,” he said.